I had two very specific LA Auto Show assignments at AskPatty: (1) a post about green cars on display and (2) a post about cars moms love. The latter is live now. But there was so much more to see than that. There were these gorgeous classic Lincolns on the first of the two press days I attended. This included the 1956 Continental Mark II that belonged to Elizabeth Taylor in the 1950s, and was said to be custom-matched to the color of her eyes. I am skeptical over this, as this car was blue and Taylor’s were famous for their violet color. But that could have been an exaggeration, like everything else in Hollywood. Still, I recall reading about the amethyst necklace Richard Burton gave her for her birthday (to match her eyes). And one of her signature perfumes was called Violet Eyes. So perhaps the makers of the Mark II simply did not get the memo? At any rate, Liz’s car was a work of art, all tailfin and chrome, with nice fat whitewall tires. This was a nice contrast to all the sleek modernity of the rest of the Auto Show. Alas, by Day 2 the old vehicles had been removed and replaced by 2013 model Lincolns. The new cars are beautiful – but not as memorable. People attend auto shows for a variety of reasons. Some are practical (if you are planning to buy a new car, this is the ideal place to begin shopping as just about every automaker on the planet is represented). But it’s also aspirational. I will likely never own a Bentley or Aston Martin – but I can admire them at close range at the show. 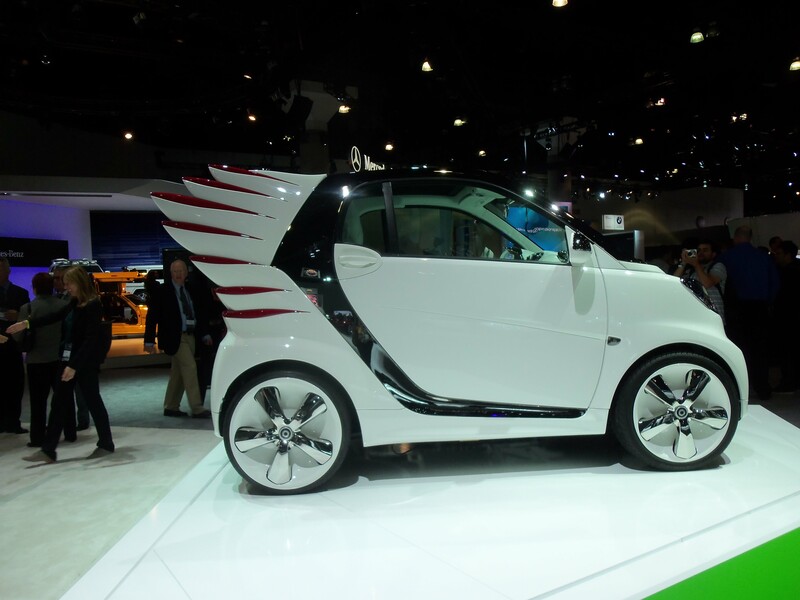 There were dream cars aplenty, including this unusual artist’s concept smartcar by designer Jeremy Scott. I spent a lot of time at the Ford and GM exhibits, but barely mentioned them in my posts, because I’ve been doing a lot with them outside the show. That is too bad, because I really, really like a lot of what they have on hand: I could see myself a happy owner of a CMAX or Fusion or Cruze or (if I could get the price down!) a Volt. But every year at the Auto Show, I always find myself gazing at the higher-end, convertible version of the car I already drive. 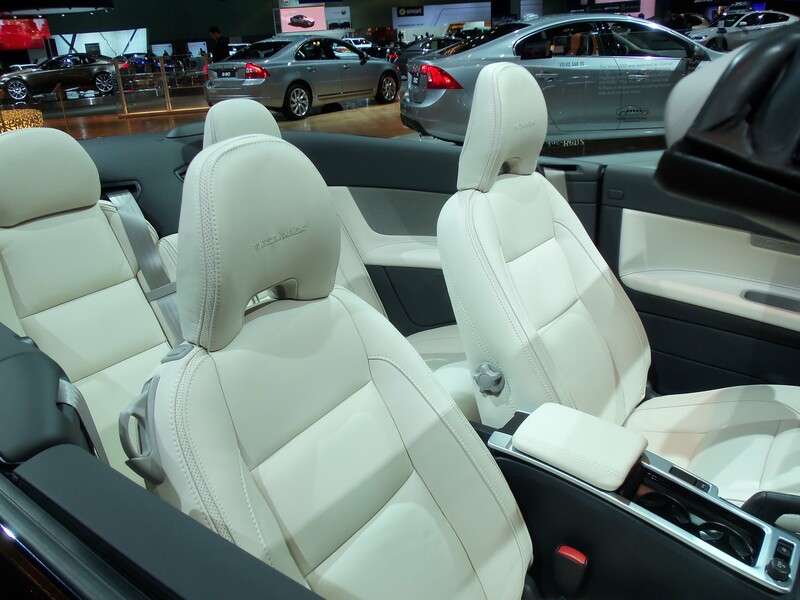 Volvo’s C70 convertible may just be my dream car – if only because I covet these creamy white leather seats. This is the reason I ended up buying my current 2006 Volvo S6: the seats are really comfortable. Thanks to my carpool buddy and the fact that my daughter no longer requires me to be home with her 24/7, I stayed through to some of the social events that followed the first day’s full schedule of press conferences. I had been told there would be an opportunity to interview some of Nissan’s executives at their reception, but could not find anyone at busy Katsuya to ask! I actually did write about this on the live blog I kept the first day of the show (which was not kept up on Day 2, thanks to the stomach bug my daughter developed that morning, which prompted an unexpected and overwhelming wave of mommy guilt). 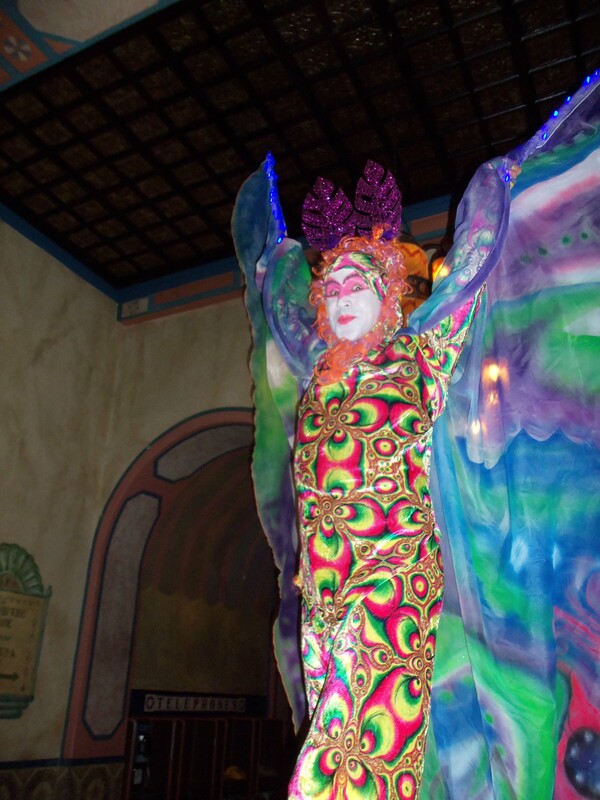 But I neglected to post any pictures of how pretty LA Live looks right now, all done up for the holidays – nor did I share the photo of the costumed performer on stilts who greeted guests at the Hyundai party held at the Figueroa Hotel. I am rectifying that oversight now. By the way: When I checked into the party on Foursquare, I was informed that this hotel is home to one of the best bars downtown. The Moroccan decor of the lobby and pool area were definitely inviting, and I probably would have checked out that bar if I had not been anxious to get home to my family. Which goes to show you that you can take the mom out of the house, but you can’t take the house out of the mom for very long. I guess that mommy guilt came over me earlier than I’d thought.